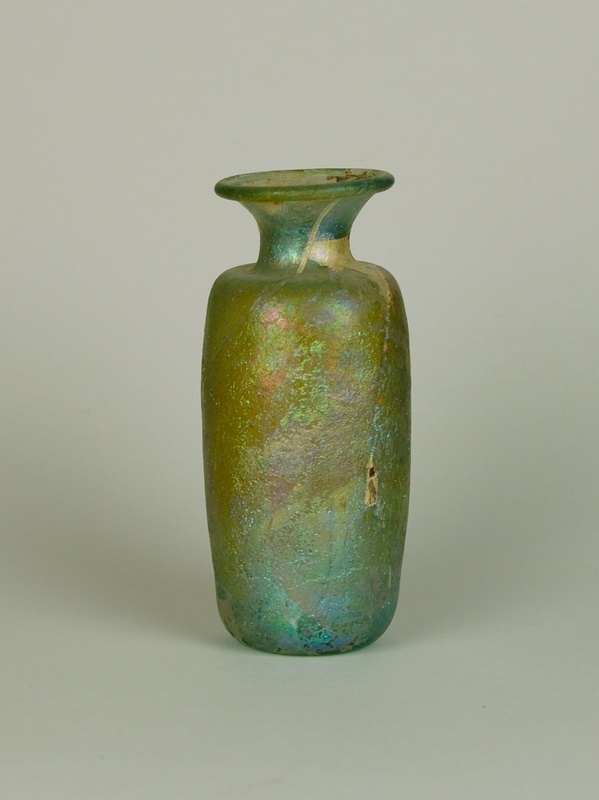 Description: This graceful bottle is completely covered with a shimmering iridescence. 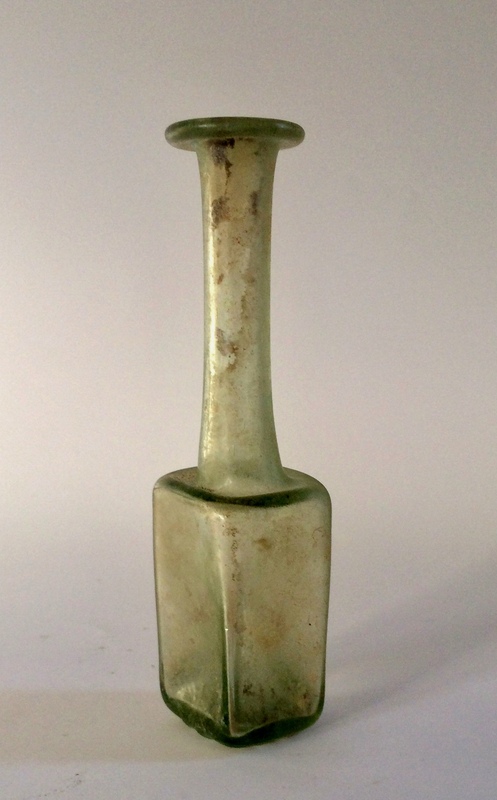 Cylindrical bottles of this period are characterized by two types of mouth: one folded in and flattened and the other more common funnel mouth with folded rim as in this example. 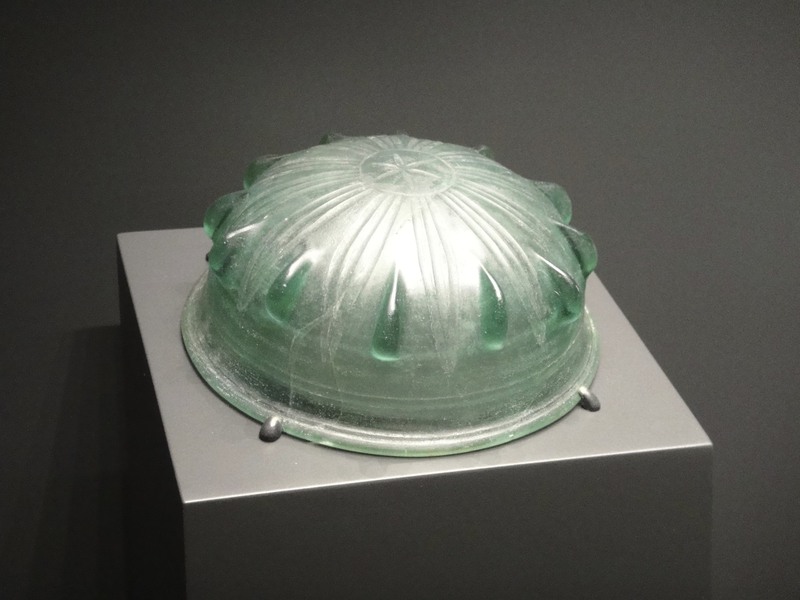 Both types of bottles are consistently made of pale green. This kind of iridescence is rare. Found in Turkey. 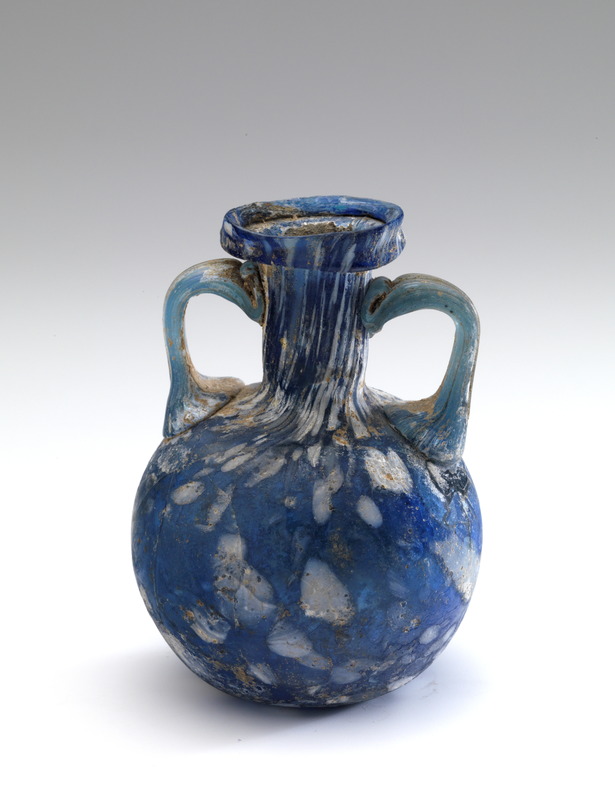 Small jug, 2nd -3rd cent. 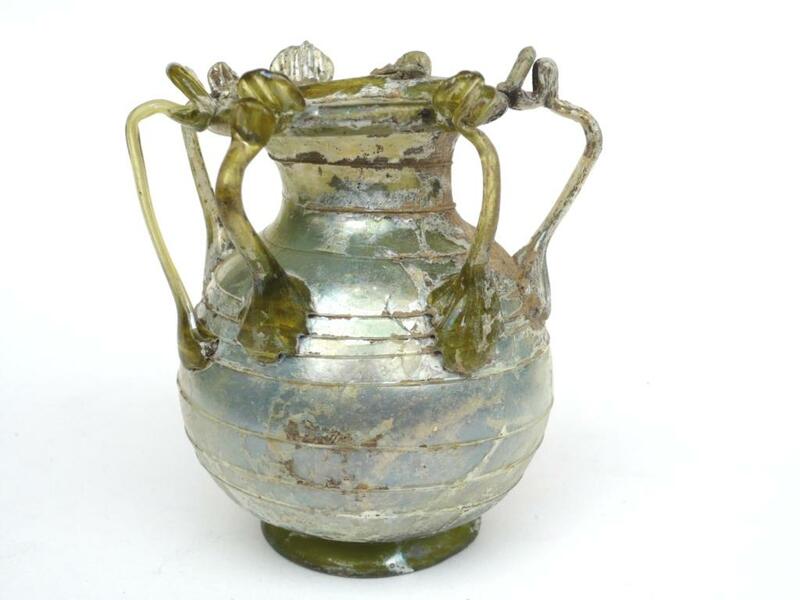 A.D.
A small Roman jug made from greenish glass. The handle has been attached to the shoulder of the flattened globular body with a kind of horseshoe shaped piece of glass. From there pulled up with a small hollow shaped band, approx. 1 cm wide, to the rim of the jug and attached with a elegant curl, a kind of thumb rest. The rim has been turned inward. The base is almost flat with a small indentation. The dimensions give this jug an elegant distinction. Dimensions:, H: 7 cm. ; largest ø 8,5 cm., ø rim 6 cm. ; weight 80,7 gram. Origin: Most probably Western Empire and from the Köln region. Until now no parallels found. 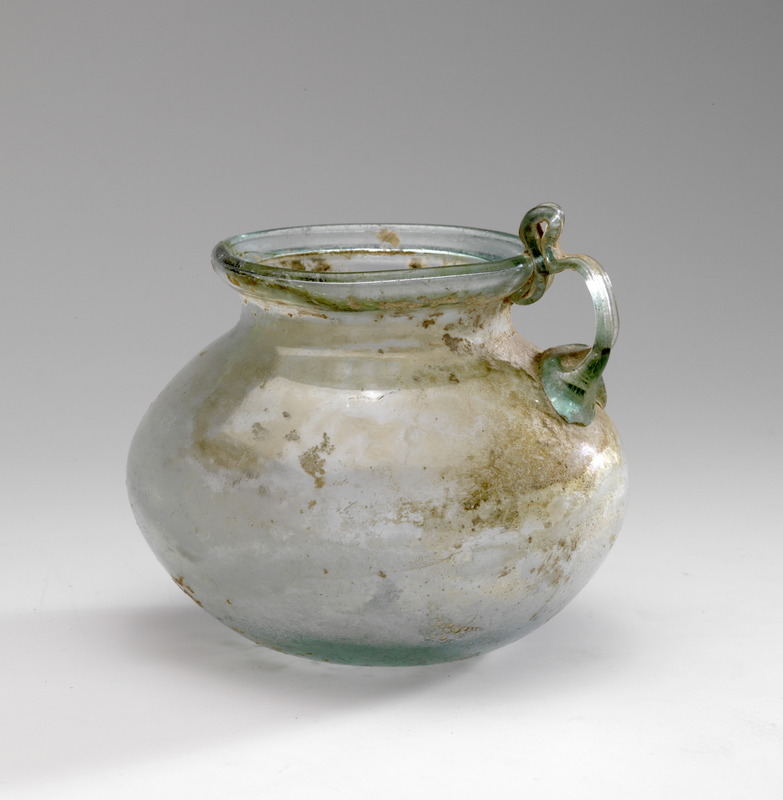 – Roman Glass from private collections, Thermenmuseum Heerlen 2011. Our interest in glass started with Modern and Contemporary glass in 1983. 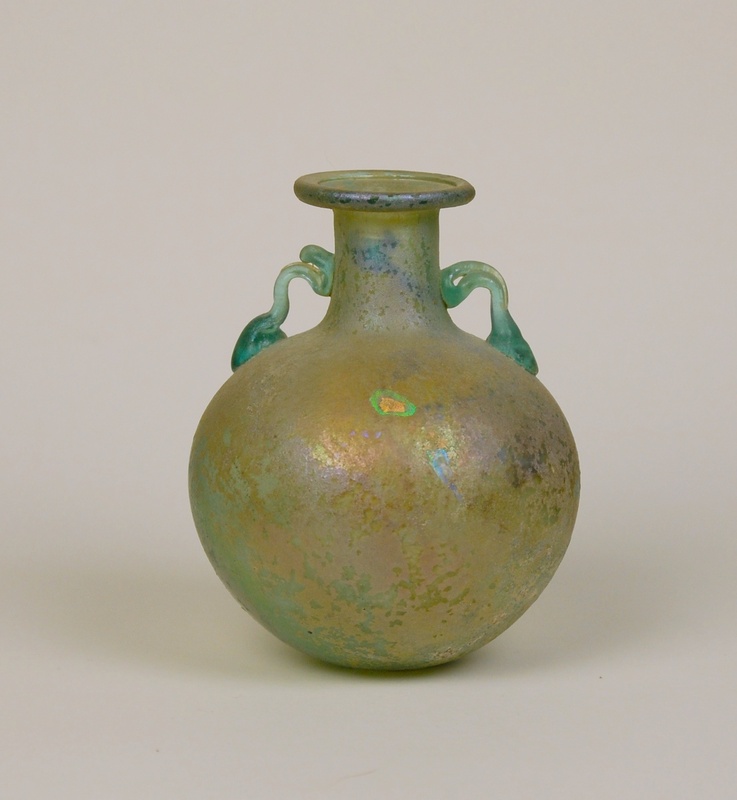 We soon discovered ancient Roman glass and the collection went in a different direction. 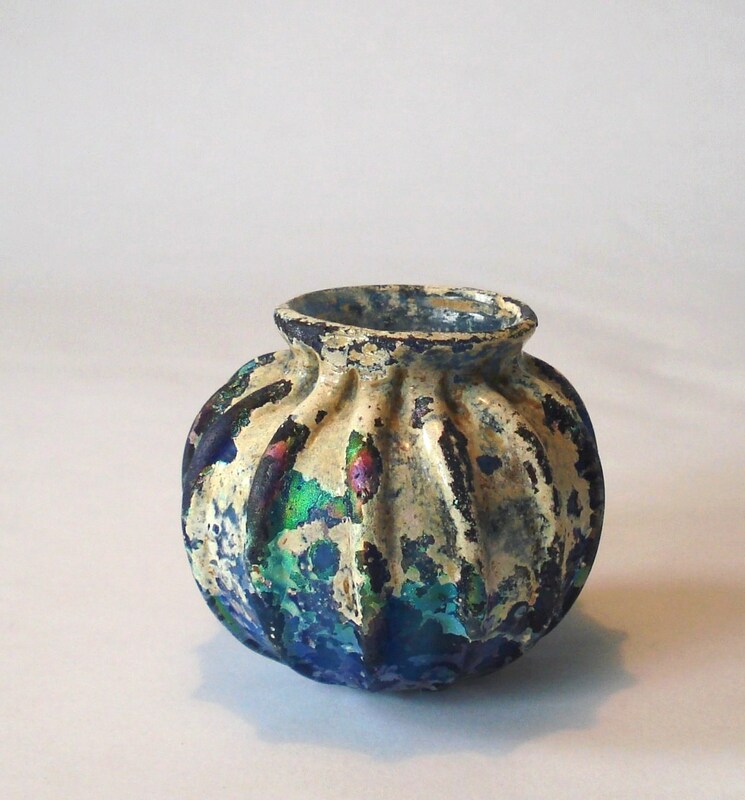 We started this site in 2009 to share the beauty of glass with those interested. 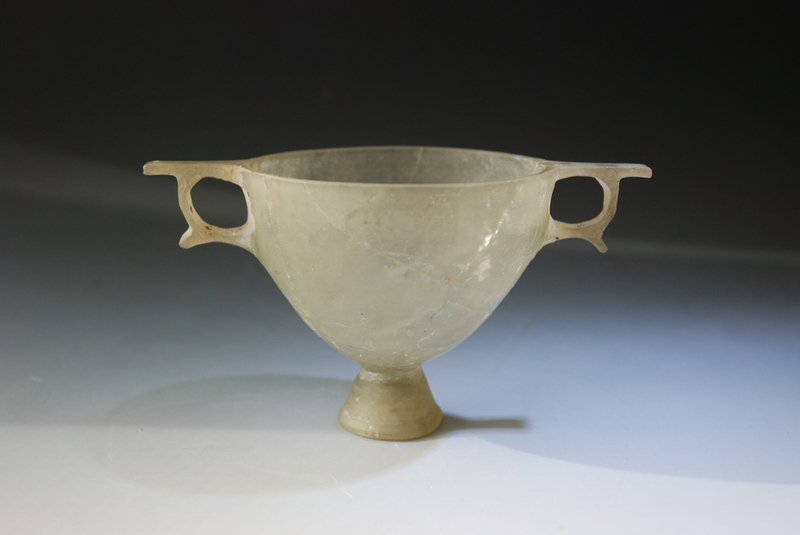 Remarks: These double handed cast and cut drinking vessels of the Hellenistic period came in two shapes. 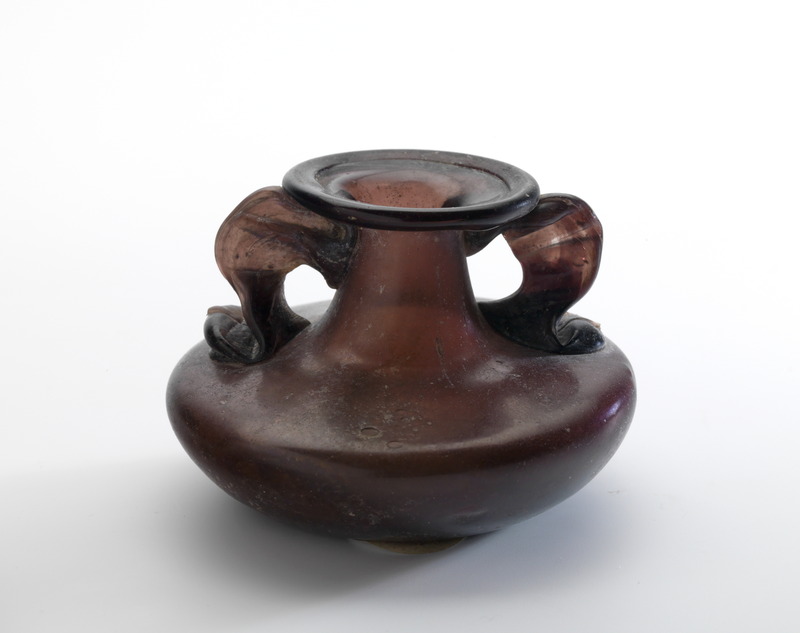 The Kantharos or Cantharos is a drinking cup or bowl with two handles on a pedestal foot and the Skyphos has no pedestal foot. 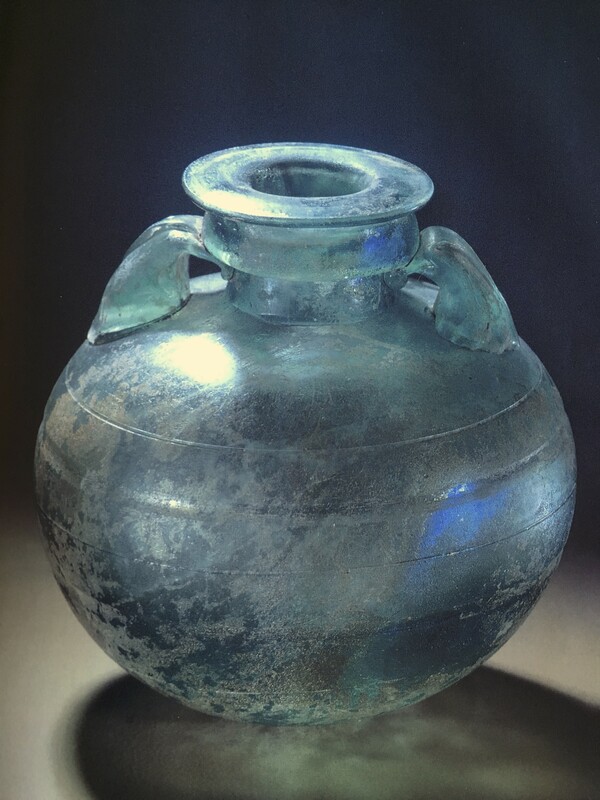 The latter shape in glass is more common. Provenance: German collection of late 1960’s. 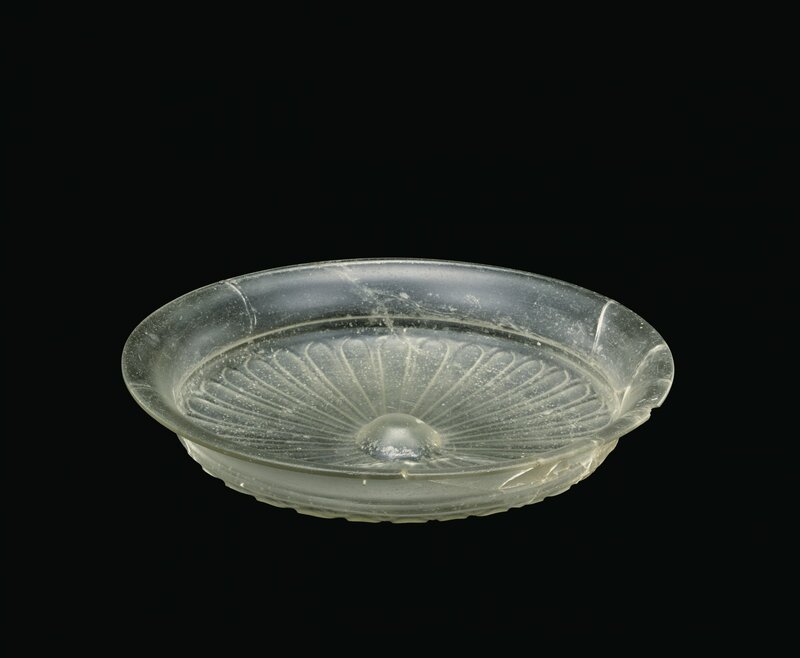 Dating: The production of these glass bowls, colorless or pale green to olive green are attributed to the period of the Achaemenid dynasty in Persia (559-330 BC). 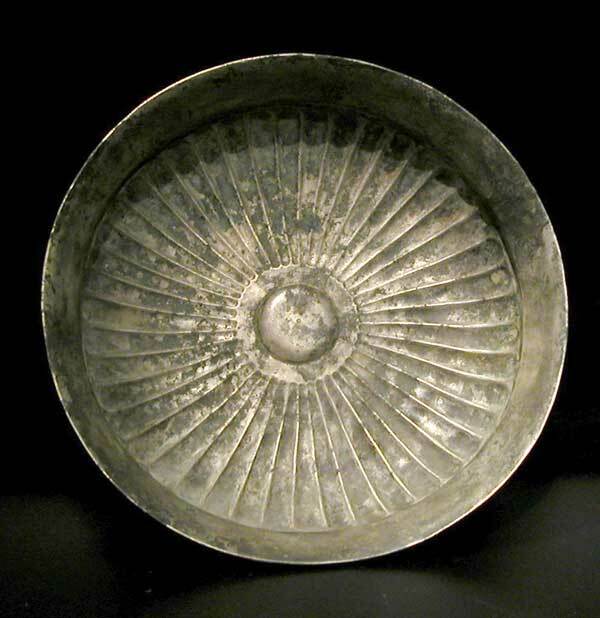 Description: The forms of the glass bowls are copied from the Achaemenid silver and bronze shapes. 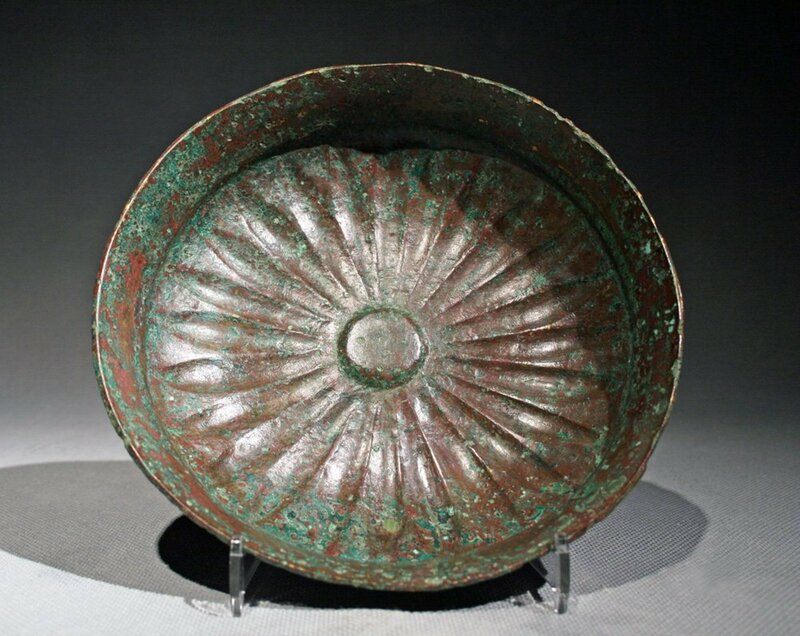 They feature either embossed fluting, rosettes of pointed leaves or lobed designs on both deep and shallow bowls with flaring rims. 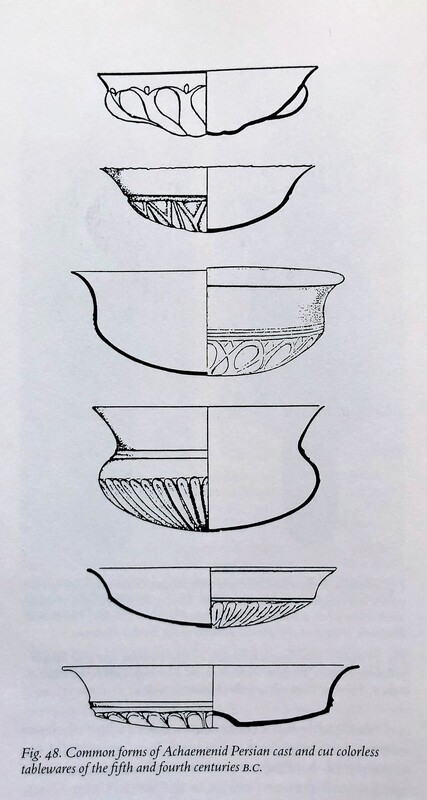 The shallower bowls are called phiales. 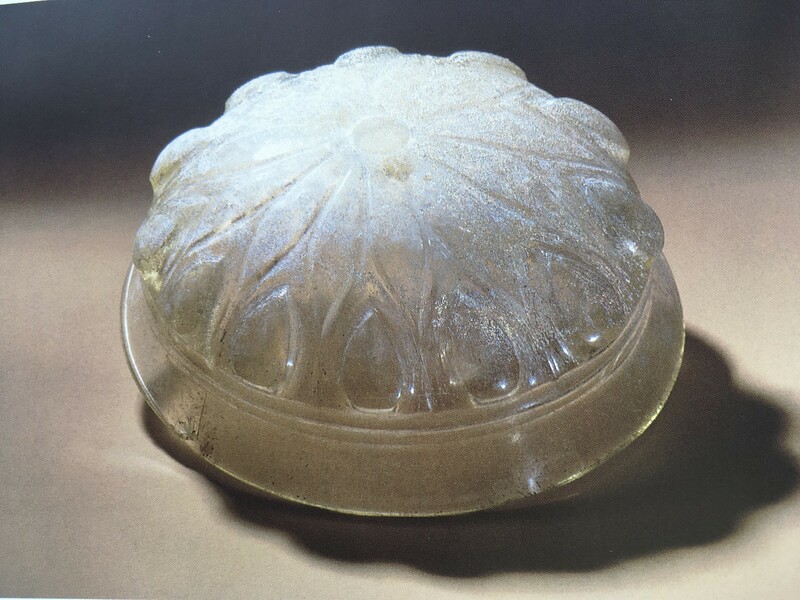 Technique: The technique of manufacture was possibly the lost-wax casting method using the finest quality glass available. 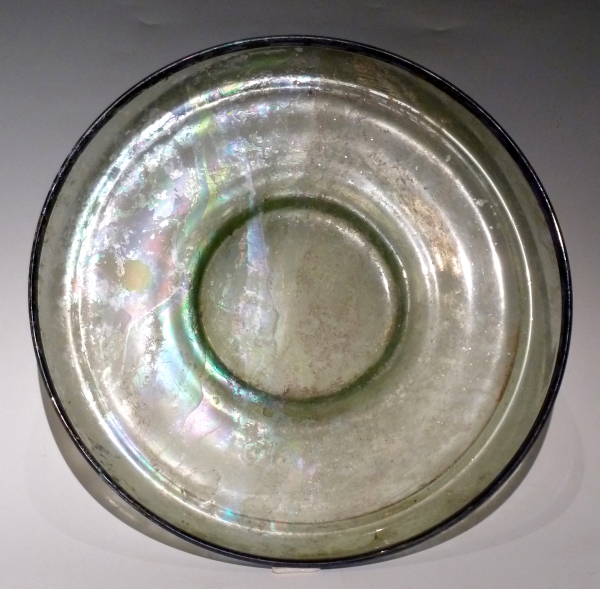 Many of these bowls show signs of being cut on the exterior and also polished on both surfaces. 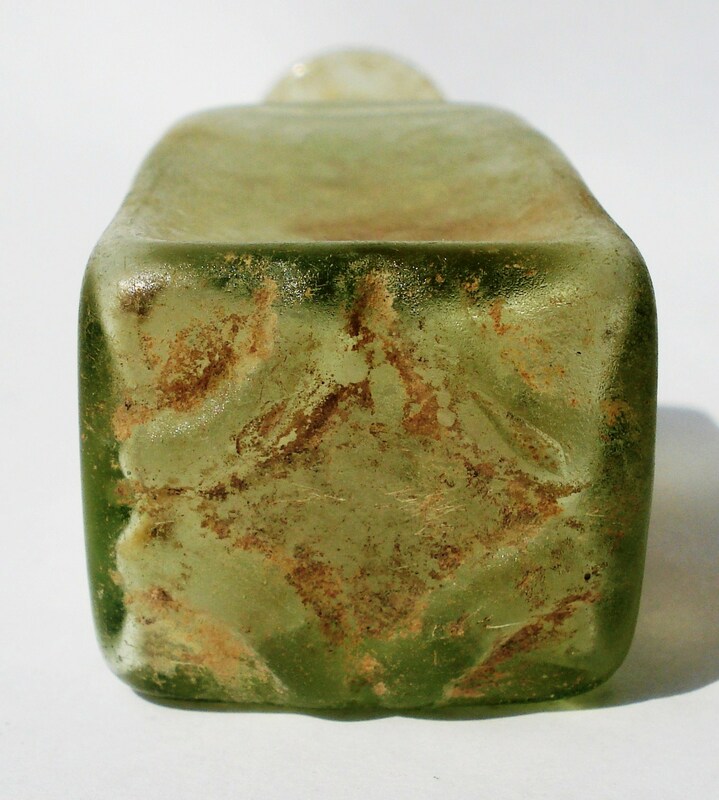 Description: Transparent pale green almost square bottle, blown in a mold with four vertical sections. With slightly tapering body toward the bottom. 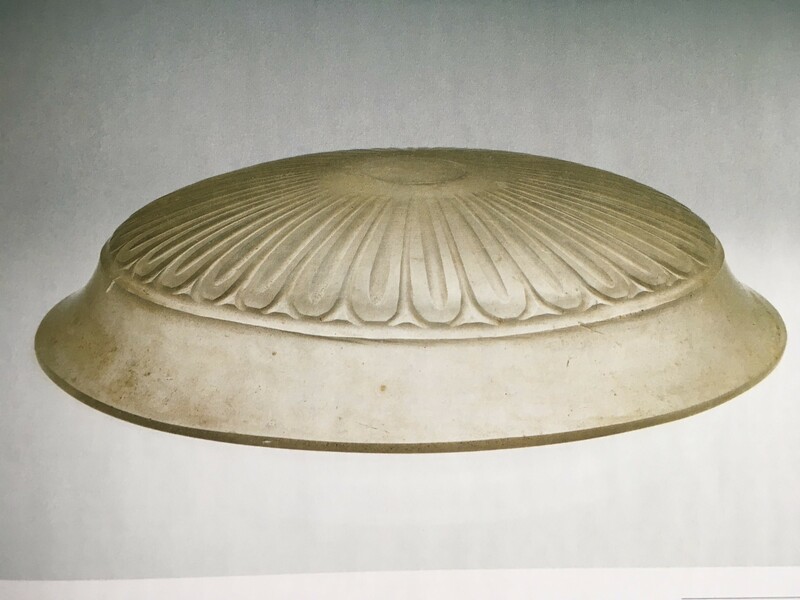 The base mark has in relief four swirls Freeblown cylindrical tall neck with outsplayed rim. 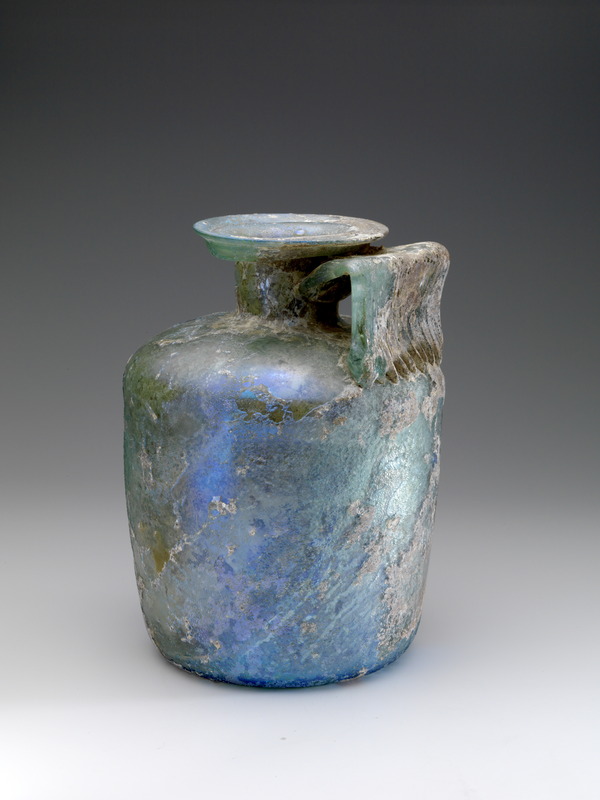 Remarks: Some bottles of this type have a picture of Mercury on the bottom, the Roman God for trade and travelers. The name can probably be traced back to the words merx or mercator, which in Latin stands for merchant or merchant. In addition to an image of Mercury, a large number of variants are known, such as combinations with simple geometrical motifs or floral such as palm branches (also on the wall) and letters, for example, G.H.F.I. or F.I.R.M. 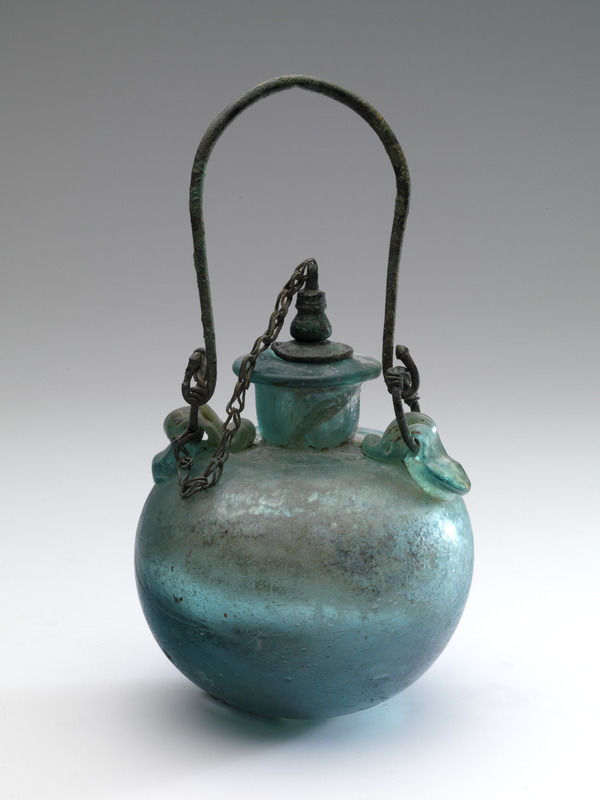 The latter could be an abbreviation of the workshop where such a bottle was produced (Latin: Firmii or Firmiorum). Bottles with the generic name ‘Mercury’ are mainly manufactured in the Rhineland, Gaul, Istria, Dalmatia and Northern Italy. Most are found in the vicinity of Cologne, in Italy, Croatia, Belgium and also in the Netherlands. According to Stern (1977), they probably served as perfume bottles. 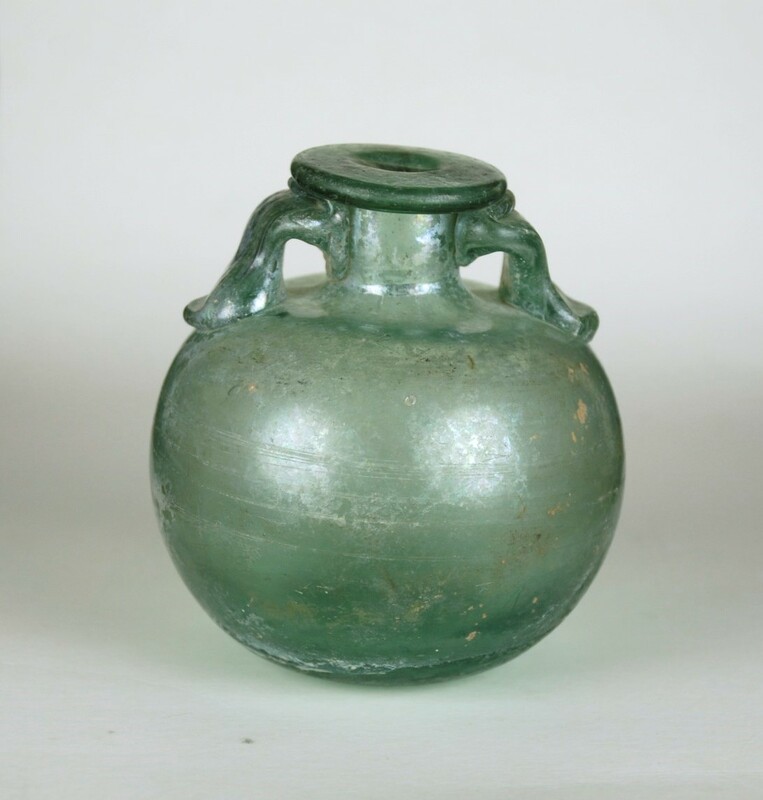 This would also explain the narrow opening (and long neck) They do not exclude the possibility that they were filled with water from a holy spring in Roman times or were meant for the storage of herbs. Facchini (1998), on the other hand, is of the opinion that several bottles found in Northern Italy containing medicinal residues are considered to be specifically intended for the sale of various medicines. Due to the rectangular shape, they are ideally suited to be transported in larger numbers at the same time. She further notes that the usual height for this is between 13 and 16 cm and the bottom dimension between 2.5 and 3.5 cm. 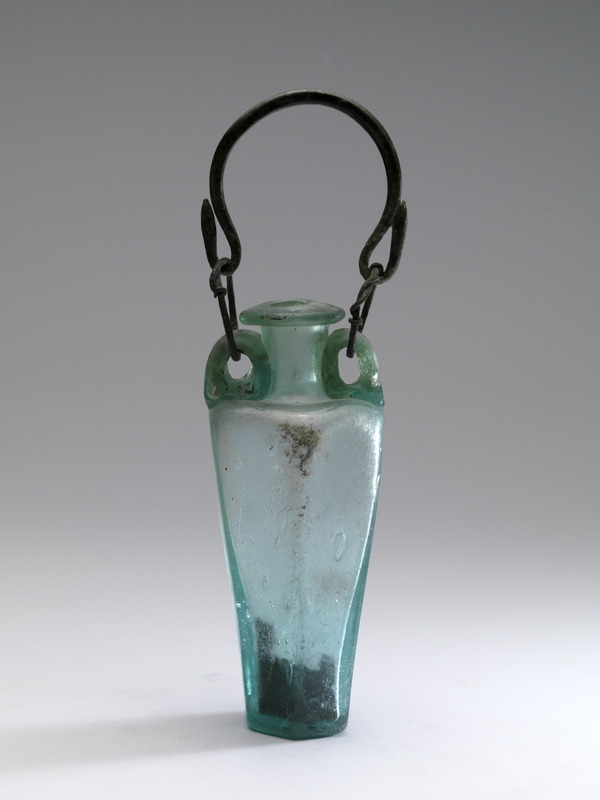 However, from elsewhere in the western Roman Empire, considerably higher Mercury bottles are known, up to 22.5 cm (Smith collection, Whitehouse 2001) and 26.5 cm (Römisch-Germanisches Museum Cologne, Doppelfeld 1966). Furthermore, larger, hexagonal, specimens have also been found in Dalmatia. Trade is of all times: thick-walled bottles may have had a content that was precious or dangerous like eye water, but, Morin Jean (1913) notes, it is also not excluded that it was a trick to make the buyer think that there is more in the bottle than was actually the case. After all, man wants to be deceived, ‘homo vult decipi’, so the Romans already knew in ancient times! 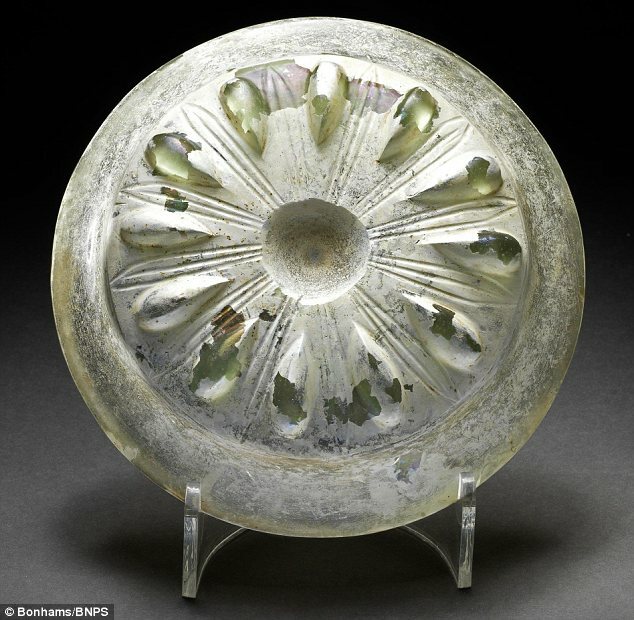 The pictures below are only part of the wonderful iridescent ancient Roman glass found in this museum. 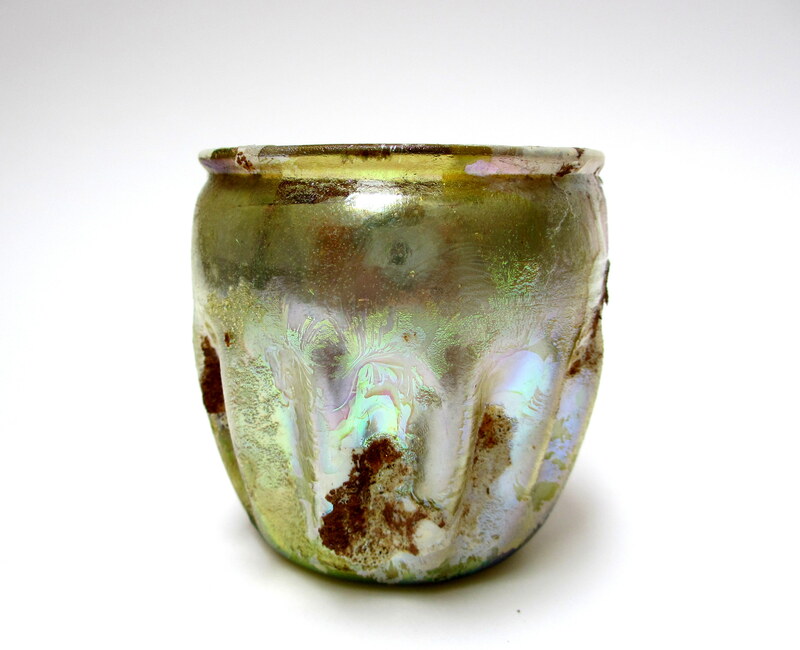 WHAT IS THE IRIDESCENCE ON ANCIENT GLASS ? The Renaissance Period was the cultural rebirth that occurred in Europe from roughly the fourteenth through the middle of the seventeenth centuries, based on the rediscovery of the literature of Greece and Rome. 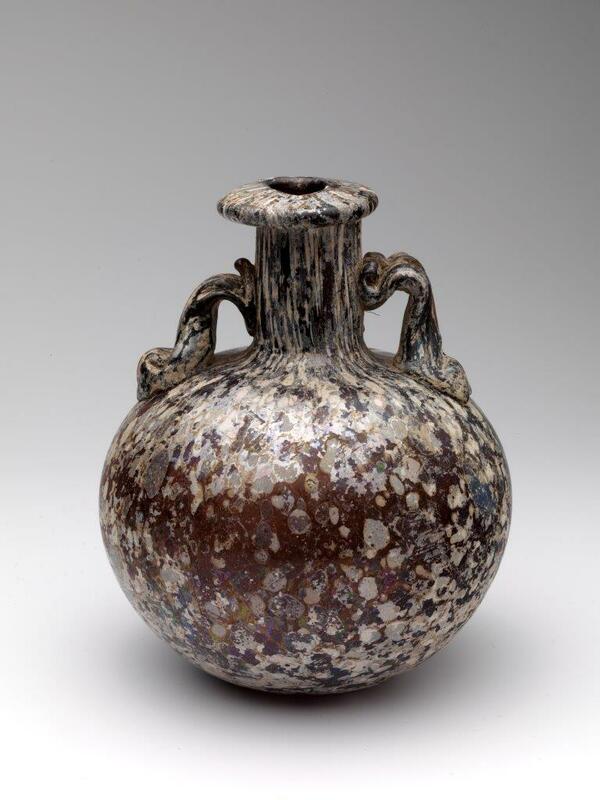 … Renaissance means “rebirth” or “reawakening.” The renaissance of glassmaking in Europe mainly took place Venice. For additional information see these links below posted on this site. 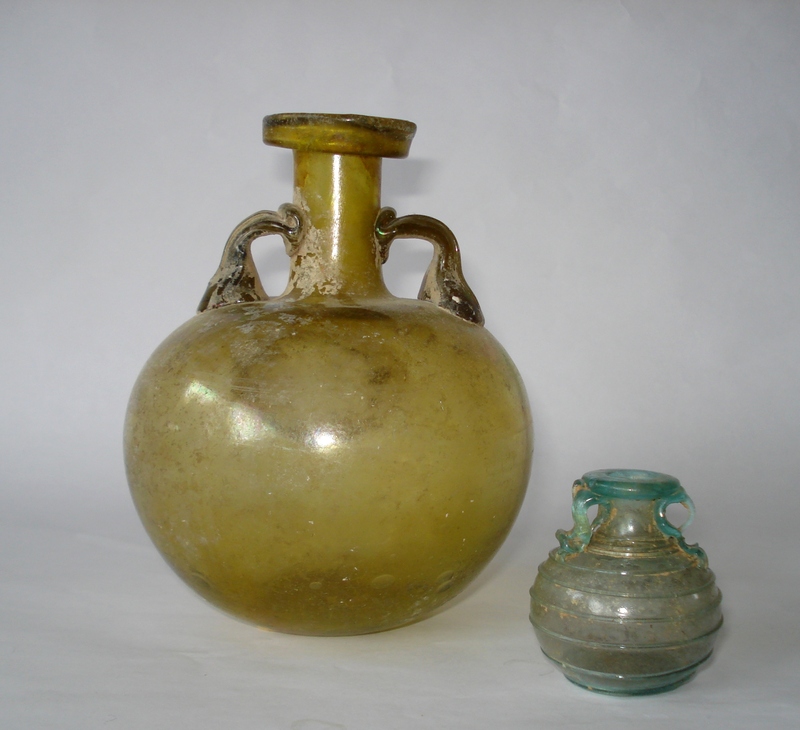 The following are examples of Venetian & Façon de Venise glass. 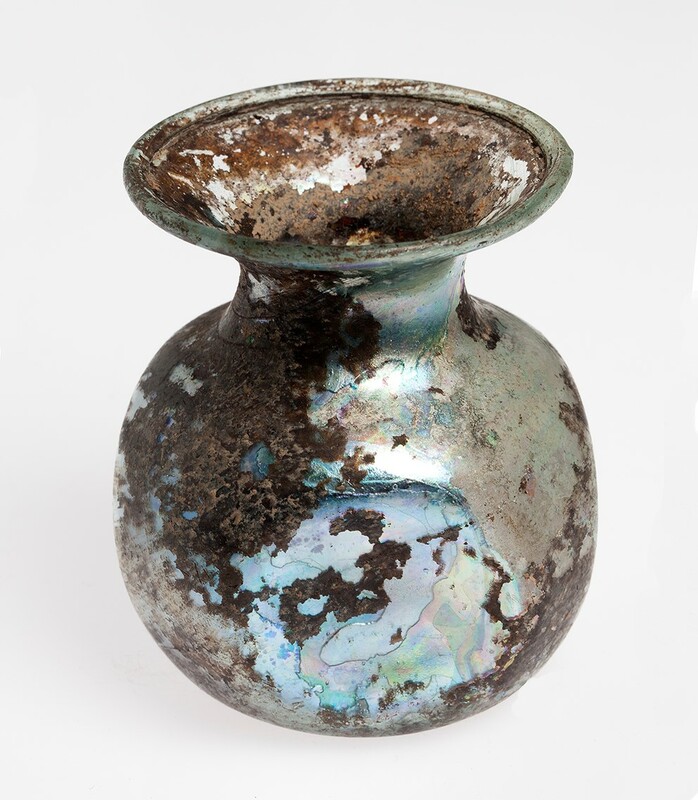 The iridescence on ancient glass was unintentional unlike what is found on modern Tiffany, Loetz, and Steuben glass. 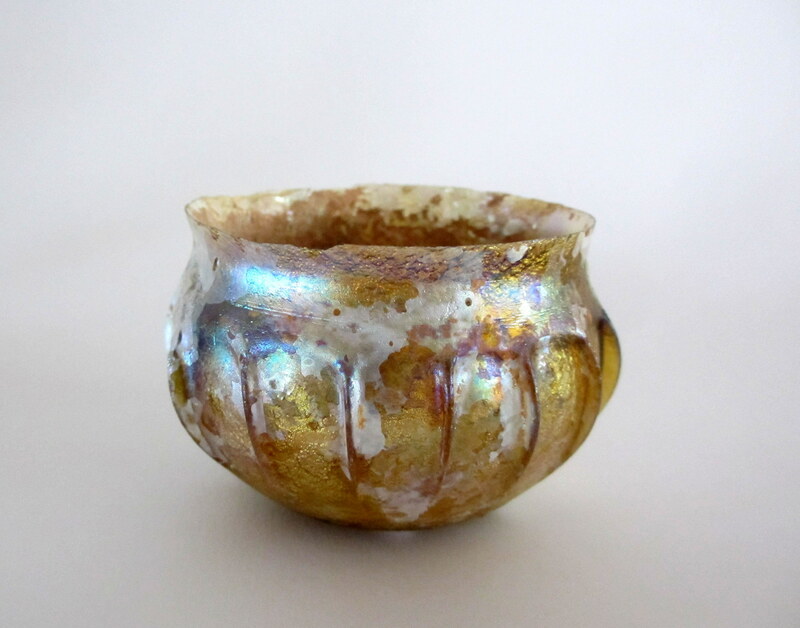 Caused by weathering on the surface, the iridescence, and the interplay of lustrous, changing colors, is due to the refraction of light by thin layers of weathered glass. How much a glass object weathers depends mainly on burial conditions and to a lesser extent the chemistry of it. These conditions are humidity, heat and type of soil the glass was buried in. 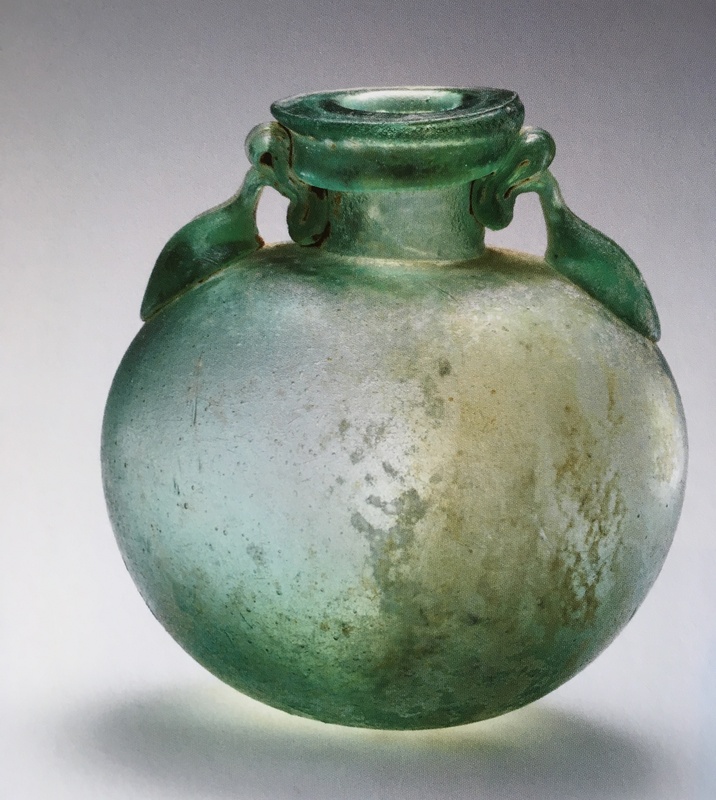 The chemistry of ancient glass though basically the same as our soda glass differed in the purity of raw materials and compositional ratio. There were also differences in flux alkali used such as natron (sodium carbonate) or potash (potassium carbonate). 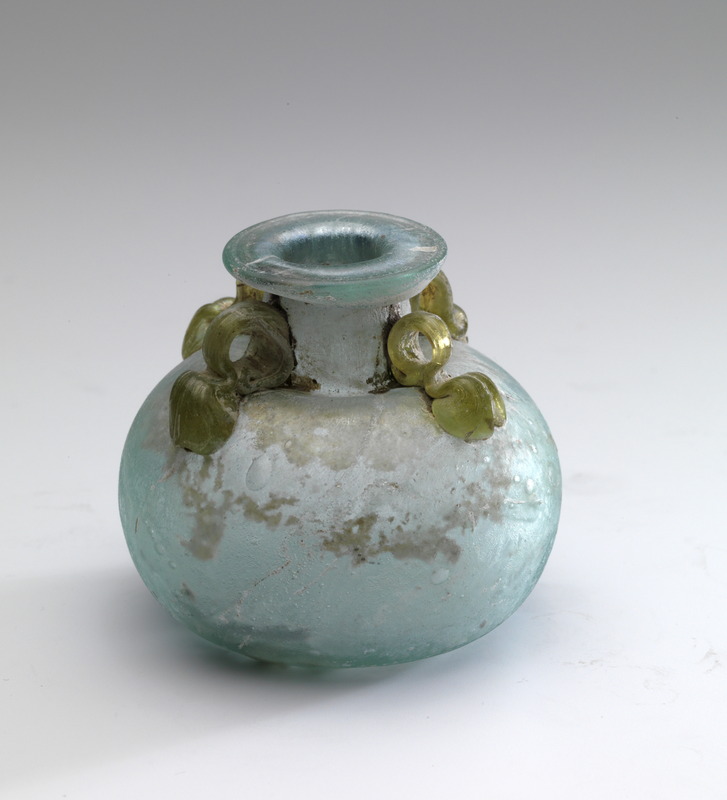 Generally glass made in the Western Provinces with potash has less iridescence than glass from the Eastern Mediterranean areas using natron. At the same time burial conditions also were different. 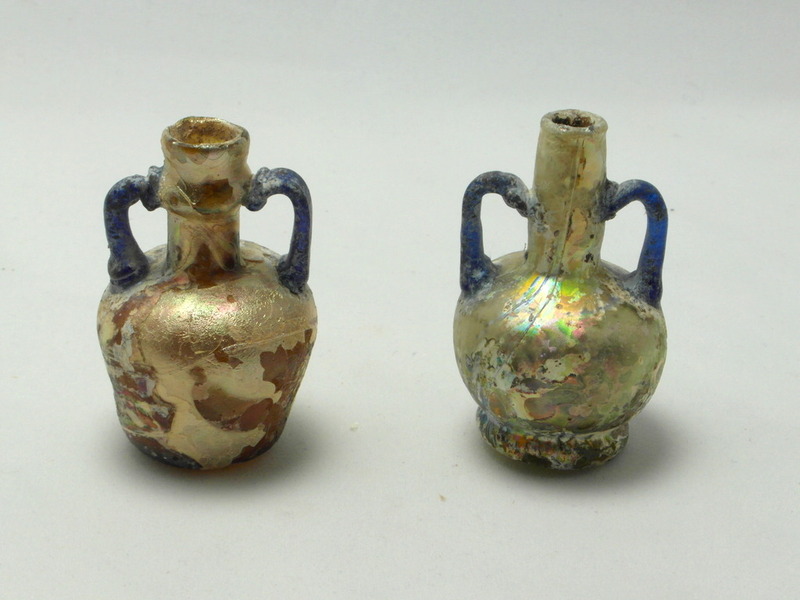 Natural iridescence is sometimes found on modern glass bottles from digs in the back yards of old houses or pulled out of river beds. The word iridescence comes from Iris, the Greek Goddess of rainbows and refers to rainbow-like colors seen on the glass which changes in different lighting. 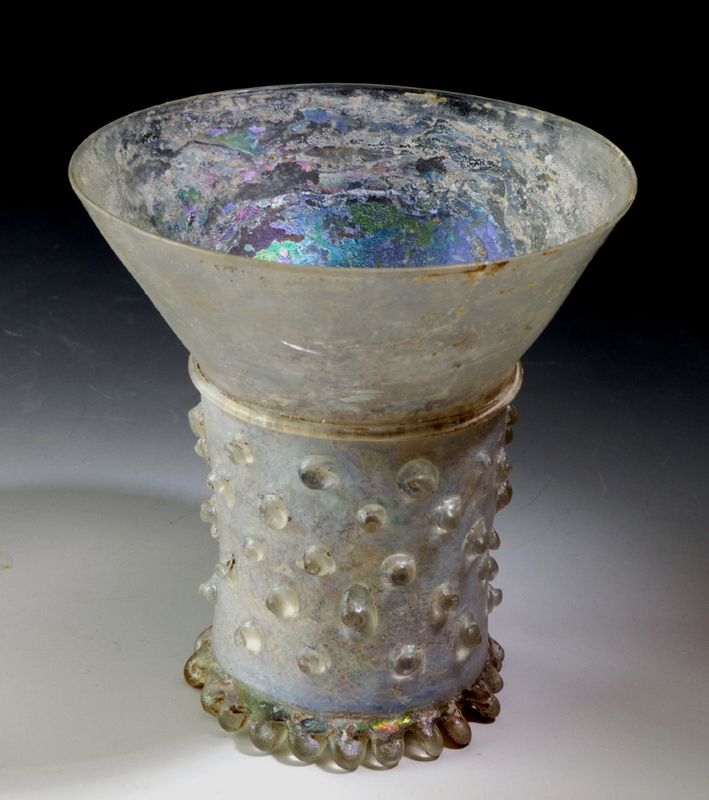 It is simply caused by alkali (soluble salt) being leached from the glass by slightly acidic water and then forming fine layers that eventually separate slightly or flake off causing a prism effect on light bouncing off and passing through the surface which reflects light differently, resulting in an iridescent appearance. 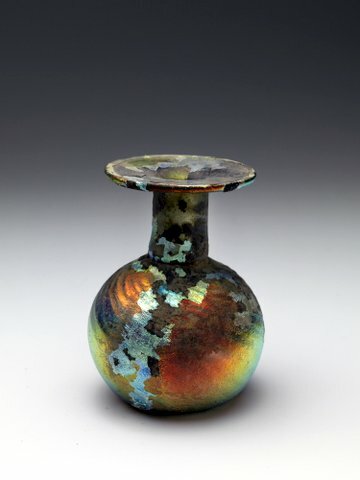 Modern iridescence sometimes called iris glass is made by adding metallic compounds to the glass or by spraying the surface with stannous chloride or lead chloride and reheating it in a reducing atmosphere.